BACKGROUND AND PURPOSE: Conventional MR imaging does not provide specific information that can be reliably associated with the pathologic substrate and clinical status of patients with multiple sclerosis (MS). Our goals were 1) to determine whether the orientationally averaged water diffusion coefficient (<D>) can be used to distinguish between plaques of different severity in these patients and 2) to assess possible correlations between <D> values and disease duration, Expanded Disability Status Scale (EDSS) score, and signal intensity on T1-weighted MR images. METHODS: Twenty patients (10 with relapsing-remitting MS and 10 with secondary-progressive MS) and 11 healthy volunteers underwent a combined conventional and diffusion-weighted MR study of the brain. <D>, a parameter that is proportional to the trace of the diffusion tensor, was computed by averaging the apparent diffusion coefficients measured in the x, y, and z directions. <D> measurements were obtained for selected areas of white matter plaques. Differences in <D> among the three groups were tested using analysis of variance. RESULTS: <D> was significantly higher (1.445 ± 0.129 × 10−3 mm2/s) in secondary-progressive lesions than in relapsing-remitting lesions (0.951 ± 0.08), and both values were higher than <D> in normal white matter (0.732 ± 0.02). 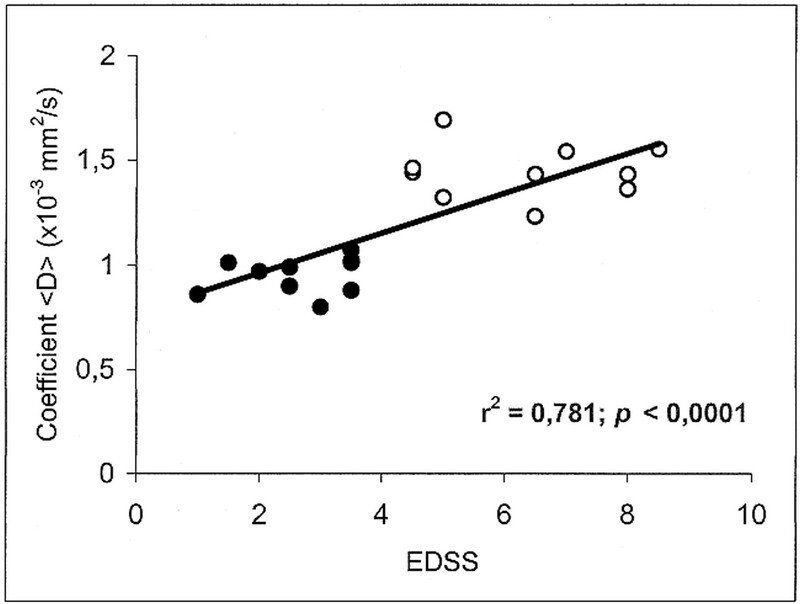 There was a significant negative correlation between <D> and the degree of hypointensity on T1-weighted images, and a positive correlation between <D> and both EDSS score and disease duration. CONCLUSION: Our findings suggest that <D> is useful for distinguishing MS lesions of different severities, which are associated with different degrees of clinical disability. In most patients with multiple sclerosis (MS), the early clinical course is characterized by episodes of acute worsening with recovery and a stable course between relapses. In more than 50% of patients, this relapsing-remitting phase, after a variable interval, is followed by a secondary-progressive phase, characterized by gradual neurologic deterioration with or without superimposed acute relapses. Disease progression from the first to the second phase is associated with a poorer prognosis, as patients with secondary-progressive disease become less responsive to treatment (1). Conventional T2-weighted MR images, although sensitive for depicting focal lesions in MS patients, lack histopathologic specificity, because inflammation, edema, demyelination, gliosis, and axonal loss are all represented as areas of high signal intensity on these sequences. These different pathologic conditions are associated with different prognoses. For example, persistent demyelination and axonal loss most likely cause disability, whereas other pathologic conditions, such as edema and inflammation, do not (2). Because of its lack of specificity, T2-weighted MR imaging does not provide information that can be reliably associated with the pathologic substrate and clinical status of patients (3). T1-weighted MR imaging seems to be more specific than T2-weighted imaging for identifying clinically relevant lesions (4). Patients in the secondary-progressive phase have been found to have a larger proportion of brain lesions that appear hypointense on T1-weighted images than do patients in the relapsing-remitting phase (5). Recent studies suggest that other imaging techniques, such as MR spectroscopy and MR measurements of brain and spinal cord atrophy, may provide information more closely related to neurologic impairment in patients with MS (6, 7). Measurement of diffusion characteristics of tissue water is another potential technique that can provide data relating to the structural properties of the human brain (8). Pathologic processes that modify the integrity of CNS structures lead to changes in the apparent diffusion coefficient (ADC). Preliminary work has indicated that ADC is increased within MS plaques as compared with normal white matter (9). The aims of our study were 1) to test the hypothesis that more destructive, long-standing plaques are more likely to display higher diffusivity than are less destructive lesions and 2) to correlate the diffusion parameter within a plaque with the corresponding value of signal intensity (SI) on T1-weighted images. Thirty-two patients with clinically definitive MS (10) were sequentially enrolled in the study. Of these, 20 patients (10 with relapsing-remitting disease, 10 with secondary-progressive disease) fulfilled the inclusion criteria. To be included in the study, patients could not have received immunosuppressive or immunomodulatory drugs for at least 1 year before the study. They also could not have had a relapse or received steroid therapy during the 3 months preceding the start of the study. Patients with relapsing-remitting disease (two men and eight women; mean age, 27 years; SD, 7 years; range, 18–38 years) had had clinically definite MS for at least 2 years with a relapsing-remitting course, and had an Expanded Disability Status Scale (EDSS) (11) score between 1.0 and 3.5 (mean, 2.6; SD, 0.9). The mean age at onset of disease was 25 years (SD, 5.8 years; range, 16–33 years). Patients with secondary-progressive MS (three men and seven women; mean age, 47 years; SD, 8 years; range, 34–59 years) had had a slowly progressive increase in disability for at least 6 months, with or without superimposed relapses, after an initial relapsing-remitting phase (12). The mean age of disease onset was 27 years (SD, 4.6 years; range, 19–35 years). There was wide variation in the duration of the initial relapsing-remitting phase (mean, 8 years; SD, 3.6 years; range, 2–27 years). The EDSS score ranged from 4.5 to 8.5 (mean, 6.3; SD, 1.5). Eleven healthy volunteers (four men and seven women; mean age, 35 years; SD, 8 years) with no history of neurologic disease served as control subjects. Approval from our hospital's ethics committee and written informed consent from all the patients were obtained before study initiation. The subjects underwent a combined conventional and diffusion-weighted MR study of the brain. All MR examinations were performed with a 1.5-T whole-body scanner with echo-planar capability. The system was equipped with actively shielded magnetic field gradient coils giving gradient pulses up to 25 mT/m with a rise time of 250 μs. A circularly polarized head coil with a diameter of 270 mm was used both for RF transmission and for reception of MR signal. The MR imaging protocol included axial and coronal T2-weighted fast spin-echo (SE) sequences with parameters of 2800/90/2 (TR/TE/excitations), axial fluid-attenuated inversion-recovery sequences with parameters of 9000/119 and an inversion time of 2470, and axial T1-weighted SE sequences (500/12/2) before and after IV administration of 0.1 mmol/kg body weight gadopentetate dimeglumine. Fifteen to 21 5-mm-thick sections with no gap, a 23- to 24-cm field of view, and a 256 × 256 matrix were obtained with all MR imaging techniques. The axial and coronal sections ran respectively parallel and perpendicular to a line that joins the anterior and posterior commissure (AC-PC line). A middle section, in the axial and coronal planes, was placed on the AC-PC line in all patients. The diffusion studies were carried out by using a single-shot diffusion-weighted echo-planar imaging sequence (6500/120). The field of view was 23 cm and the acquisition matrix was 128 × 128. Twenty-one 5-mm-thick sections with no gap were acquired parallel to the AC-PC line to cover a brain volume of 10.5 cm. The diffusion gradients were sequentially applied in the x-, y-, and z-axis directions with four different b values (0, 50, 500, and 1000 s/mm2). In each region of interest (ROI), the ADCs in the x, y, and z directions (ADCx, ADCy, and ADCz) were calculated using the Stejskal and Taner equation (13) by linear fitting of the logarithm of the SI (ln SI) versus b values. Trace (D) is equal to the sum of the diagonal elements of the diffusion tensor (Dxx, Dyy, Dzz) (14). If there is no diffusion sensitization produced by the imaging gradients, ADCx, ADCy, and ADCz are equal to the diagonal elements of the diffusion tensor (15). We assumed that the diffusion sensitization produced by the imaging gradients in our sequence was negligible and we computed trace (D) by summing ADCx, ADCy, and ADCz on a pixel-by-pixel basis. This assumption is usually valid for well-designed diffusion sequences on clinical scanners (16). We then divided trace (D) by three to obtain the orientationally averaged ADC, <D>. We measured the orientationally averaged water diffusion coefficient <D> in plaques of patients with relapsing-remitting and secondary-progressive MS. <D> is equal to one third of the trace of the diffusion tensor, trace (D) (14). Both <D> and trace (D) are rotationally invariant quantities that reflect an intrinsic property of the diffusion process and do not depend on the orientation of the subject in the magnet (17). Measurements of <D> were made in ROIs within the lesions. Lesions were localized on transverse T2-weighted fast SE images and classified on corresponding contrast-enhanced T1-weighted images as enhancing or nonenhancing. Given their small number (four lesions), the enhancing lesions were not considered further. The nonenhancing lesions were classified as T1 isointense or hypointense. T1 hypointensity was defined as reduced lesion SI with respect to the surrounding normal-appearing white matter. After localizing the lesions on the T2-weighted sequences, circular ROIs were drawn within the lesions on the diffusion-weighted T2-weighted axial images (b value = 0) and subsequently projected onto the orientationally averaged ADC map to obtain the mean ± SD of <D>. To avoid inhomogeneities of SI within the ROIs, the selected ROIs were small enough to avoid partial volume artifacts and large enough to average signal from several pixels. Each ROI had approximately 25 pixels, corresponding to 45 mm2 (pixel size = 1.8 × 1.8 mm). Lesions smaller than 30 mm2 were not considered for diffusivity evaluation. ROIs drawn on the diffusion-weighted T2-weighted axial images were also copied on the corresponding T1-weighted images. Given the lack of spatial correspondence between diffusion- and T1-weighted images, ROIs were manually adjusted to fit centrally only in the visible lesions; that is, the hypointense lesions. Isointense lesions, which were not distinguishable from the surrounding normal-appearing white matter, were not considered. 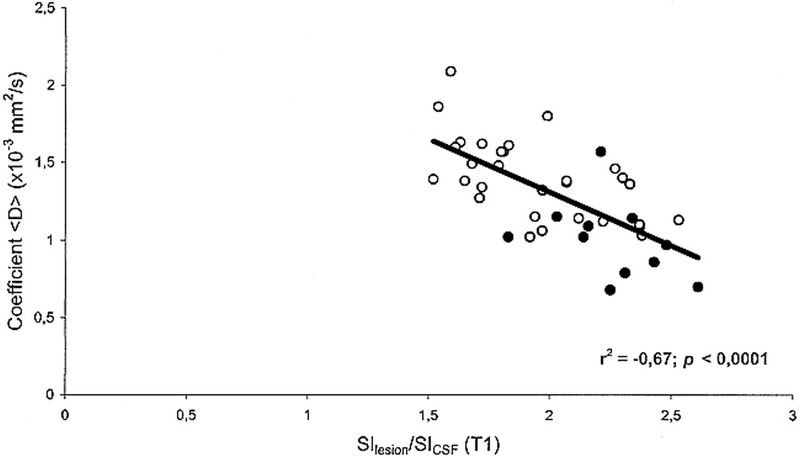 The SI value of T1 hypointense lesions was recorded and normalized to the SI of the CSF (SIlesion/SICSF) to correct for random variation in overall SI between examinations. Hypointense lesions located in sections that did not contain CSF were not evaluated. In total, 41 T1 hypointense lesions were considered, 11 from the relapsing-remitting group and 30 from the secondary-progressive group. Those ROIs, which were in the vicinity of sources of susceptibility artifacts, like the frontal and temporal sinuses, were not evaluated. The sections above and below the selected section were reviewed to ensure that the final voxel of interest did not include CSF or normal-appearing white matter in which a lesion was being studied. ROIs of uniform size (approximately 45 mm2) were also manually positioned in four white matter areas (frontal, parietal, temporal, and occipital) in control subjects to calculate <D> in the normal white matter. All ROIs were chosen by one investigator and reviewed retrospectively by another. Both investigators were blinded as to whether the patients were from the relapsing-remitting or secondary-progressive group. One-way analysis of variance among groups (relapsing-remitting vs. secondary-progressive vs. normal white matter) was performed on the values of <D>, followed by Student-Newman-Keul post hoc comparisons. Figure 2 shows the scatter plot of the actual <D> data points for the three groups studied. Each point corresponds to one subject and represents the mean value of <D> as obtained in each subject from all the ROIs that were drawn on the T2-weighted (b = 0) images. A multiple correlation between <D>, EDSS score, disease duration, and SIlesion/SICSF on T1-weighted images was also carried out. The level for statistical significance was set at P < .016, according to the Bonferroni correction. A linear regression analysis was performed between age group (by years) and <D> in the healthy control subjects. A t-test was used to compare the duration of the disease between the two groups of patients (relapsing-remitting vs. secondary-progressive). The mean value ± SD of <D> was 0.732 ± 0.02 × 10−3 mm2/s in the white matter of healthy volunteers, 0.951 ± 0.08 in the plaques of patients with relapsing-remitting MS, and 1.445 ± 0.129 in the plaques of patients with secondary-progressive MS. Statistically significant differences in <D> were found between all groups: relapsing-remitting vs. secondary-progressive (P < .0001), normal white matter vs. relapsing-remitting (P < .0001), and normal white matter vs. secondary-progressive (P < .0001) (Fig 2). Each point in Figures 3 and 4 corresponds to one patient and represents the mean value of <D> as obtained from all the ROIs that were drawn on the T2-weighted (b = 0) images vs. EDSS score and disease duration, respectively. In MS patients, there was an inverse correlation between <D> and the T1-weighted SIlesion/SICSF ratio (r = −.67; P < .0001) (Fig 5). 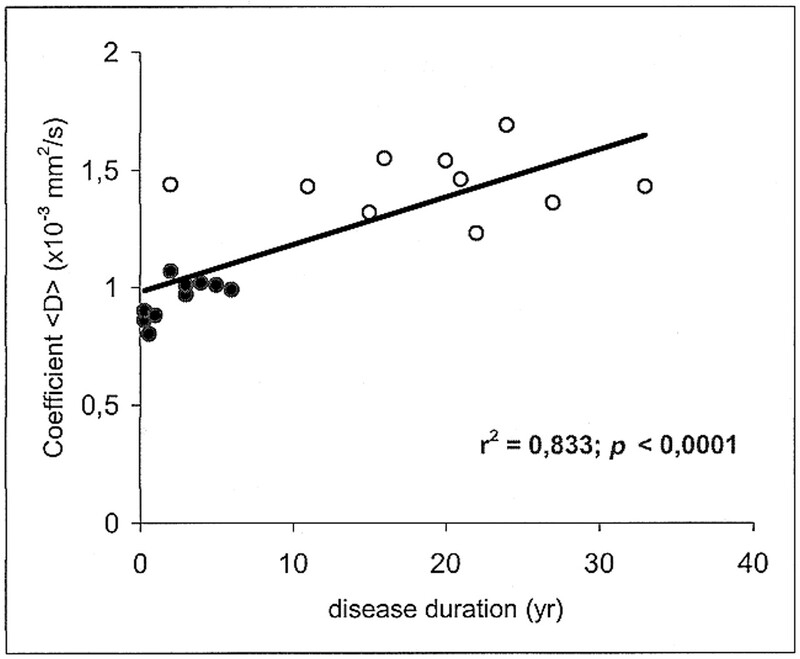 Furthermore, there was a positive correlation between <D> and both EDSS score (r = .781; P < .0001) (Fig 3) and disease duration (r = .833; P < .0001) (Fig 4). We found no correlation between age and <D> in healthy control subjects (r = .02; not significant). Disease duration was significantly longer in the secondary-progressive group (mean, 19 years; SD, 9 years) than in the relapsing-remitting group (mean, 3 years; SD, 2 years). This is not surprising, since most of the patients with MS progress from an initial relapsing-remitting to a secondary-progressive form. Several lines of evidence indicate that the pathologic substrate of MS lesions is different among MS subgroups and that disease progression from the initial relapsing-remitting to the secondary-progressive form is associated with neuronal and axonal loss (18–20). Axonal loss, in turn, is likely to play a major role in determining permanent neurologic dysfunction in patients with MS (21, 22). Quantitative clinical assessments of disease progression in MS are not very sensitive. Therefore, there has been great interest in developing markers of disease progression based on measurements of MR lesion volume or lesion frequency. Unfortunately, these potential markers have shown only a rather weak correlation with clinical disability (23, 24). Standard MR imaging can be used to detect some types of abnormalities among the clinical subtypes of MS, such as the large number of contrast-enhancing lesions in the absence of brain atrophy in patients with relapsing-remitting MS (25) and brain and spinal cord atrophy as well as a larger proportion of hypointense lesions on T1-weighted images in patients with secondary-progressive disease (26). Nevertheless, conventional MR imaging parameters permit only a rough estimation of the progression of disability and therefore are of limited use in following affected patients (24). Other MR parameters have been used to characterize structural changes occurring during the course of MS. Magnetization transfer–based contrast has been found to be associated with edematous lesions in experimental allergic encephalomyelitis, with microscopic abnormalities in normal-appearing white matter, and with hypointense T1-weighted lesions in MS (27–29). Proton MR spectroscopy has demonstrated decreased levels of N-acetylaspartate (NAA), a neuronal marker of the adult CNS (30), in the brains of patients with secondary-progressive MS, suggesting extensive axonal damage in these patients, unlike those with relapsing-remitting MS (6, 22). Excellent agreement was found between <D> values in the white matter of healthy subjects in our study and previously published data (16). We found an increased water diffusivity in all MS lesions as compared with normal white matter in control subjects. Moreover, we found a larger increase in <D> values in secondary-progressive than in relapsing-remitting plaques. It could be argued that this difference in diffusivity may be related to the differences in age between the patients in the relapsing-remitting and secondary-progressive groups; however, since in our sample of healthy subjects we did not find a significant correlation between age and <D> values, it is unlikely that the large difference in <D> between these two groups can be attributed to age differences. This study therefore suggests that differences in the <D> values are related to a different pathologic substrate in the two subgroups of MS. The increase in diffusivity possibly reflects expanded free water content within the lesion, although the relative contribution from edema, demyelination, and axonal loss is difficult to determine. One can speculate that in the acute phase of the disease, the expanded extracellular volume is due to astrocyte proliferation, perivascular inflammation, and demyelination, all representing pathologic stigmata of the initial step in plaque formation, whereas in its chronic stage, the more pronounced increase in diffusivity represents axonal loss and tissue destruction. More recently, it has been shown that axonal injury is associated with demyelination from the beginning of the disease, suggesting that axons are a disease target even in the early phases of plaque formation (21). Most likely, these processes are combined, with a predominance of the inflammatory process in relapsing-remitting MS and of the destructive processes in secondary-progressive MS.
A second result of this study was the significant inverse correlation between <D> and the SIlesion/SICSF ratio on T1-weighted images within the corresponding brain lesion. Hypointense T1 lesions, so-called black holes, have been related to the degree of matrix destruction and loss of axons in MS (31). A change in the T1-weighted lesion load has been found to correlate with a change in EDSS score over a 3-year period in secondary-progressive MS (26), and the degree of hypointensity on T1-weighted images with a lower magnetization transfer ratio (29, 32, 33). More recently, using proton MR spectroscopy, investigators have found a strong correlation between NAA concentration and both the degree of lesion hypointensity and T1-relaxation time measurements, providing in vivo evidence of axonal damage in severely hypointense T1 lesions in MS patients (34). Our results indicate that lesions that are very hypointense on T1-weighted SE images have higher <D> values than do lesions that are less hypointense. Given this close correlation, we speculate that <D> measurements and T1 hypointensities provide highly associated information and may reflect the same differences in lesion composition, with the advantage for <D> of being an inherently quantitative parameter. More precisely, our findings are consistent with the concept that high diffusion <D> values are associated with tissue destruction in MS. Hypointensities on T1-weighted images do not solely represent tissue destruction of the late stages of the disease but may also be associated with acute lesions. The hypointensity in this case may be the result of enlargement of the extracellular space because of edema and inflammation, a process that is potentially reversible at follow-up (35). Indeed, most of these acute hypointensities will resolve over time, whereas a portion of them, after a variable interval, will reappear as true black holes, representing a more permanent and irreversible stage of tissue damage. Although the precise histopathologic basis for increased diffusivity is not known at this moment, the chronological window between the acute and chronic stage of lesion development, during which lesions are not visible on T1-weighted images, might become a possible domain of diffusion-weighted imaging in MS patients. Reports on diffusion changes in MS lesions have differed among laboratories. Previous publications have reported increased ADC values in MS plaques, with acute lesions displaying higher ADC values than chronic lesions (36, 37). Because these previous investigators used diffusion-weighted imaging, their results are not directly comparable with our findings. Diffusion-weighted imaging results are generally difficult to interpret because the SI in diffusion-weighted images is affected by a number of factors, such as the orientation of the subject in the magnet and the degree of T2-weighted hyperintensity, both of which are unrelated to the diffusion process. The orientationally averaged water diffusion coefficient <D> that we measured in this study is a quantitative parameter that reflects a specific feature of the diffusion process and is unaffected by the orientation of the subject in the magnet or the degree of hyperintensity on the T2-weighted images (17). 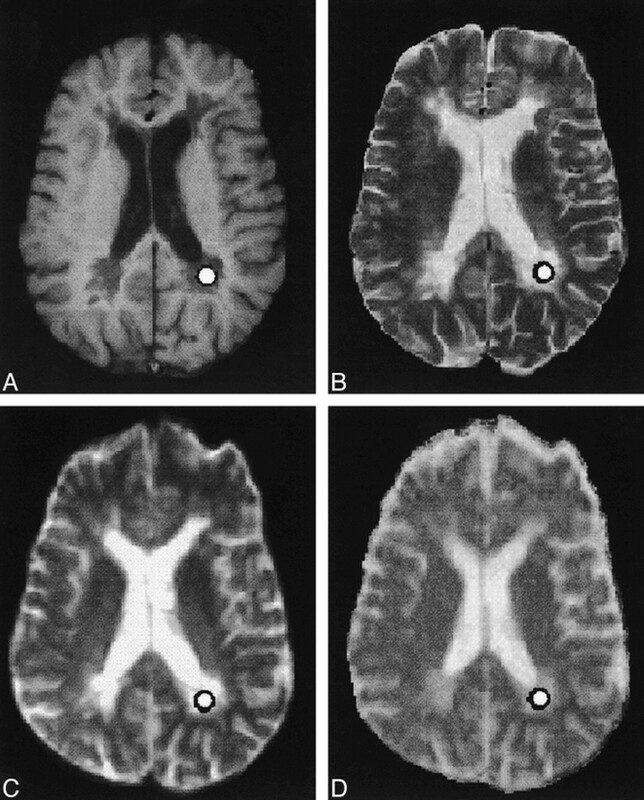 In a study by Horsfield et al (9), in which the diffusion gradients were also applied sequentially in the x, y, and z directions, the orientationally averaged ADC was found to be increased in all the lesions, without significant differences between benign and secondary-progressive MS. The latter finding differs from the result of our investigation, in which patients with secondary-progressive MS had significantly higher <D> values than did patients with relapsing-remitting MS. One possible explanation for this discrepancy is that patients with benign MS in the series by Horsfield et al had a long disease duration (mean, 21 years). It is reasonable to assume that individual plaques in these patients were old enough to show a high degree of matrix destruction, and thus high diffusivity, but were too few, or were not located at critical sites, to cause significant disability. Recently, full diffusion tensor imaging has been used to characterize the structural changes in plaques of different pathologic severity in six patients with MS (38). The findings of that study, showing the highest diffusion values in destructive (T1 hypointense) lesions, are in keeping with our results, and suggest that water diffusivity within the lesion is related to the severity of the pathologic substrate. In addition to the orientationally averaged diffusion coefficient, other diffusion parameters, such as diffusion anisotropy (39), may be helpful in characterizing the anatomic-pathologic features of MS plaques (38). Measuring diffusion anisotropy, however, requires the entire diffusion tensor to be computed from a set of diffusion-weighted images acquired with diffusion-sensitizing gradients applied in at least six non-collinear directions (39). Limitations of our pulse sequence did not allow us to acquire the complete imaging data set necessary to calculate the entire diffusion tensor in this study; however, our data were sufficient to reliably assess the orientationally averaged diffusion coefficient. Our results indicate that the orientationally averaged coefficient <D> is able to show the distinction between relapsing-remitting and secondary-progressive MS plaques. In addition, this parameter correlates with the degree of lesion hypointensity on T1-weighted MR images as well as with the clinical status in individual patients. This latter finding supports the hypothesis that differences in disability can be explained by structural differences among lesions as seen by <D> measurements. Serial studies in larger clinical cohorts are necessary to determine the reliability of <D> in assessing disease progression in MS. 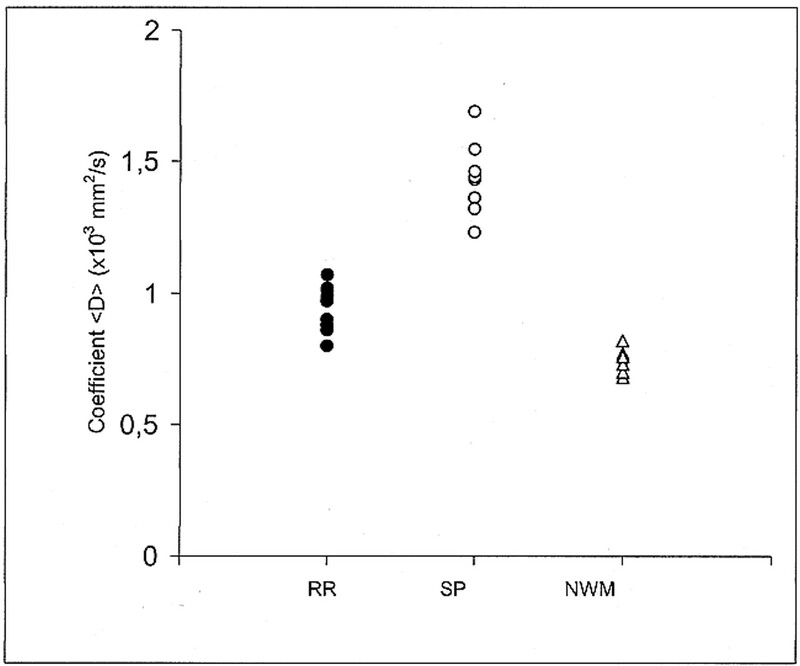 It is likely that the orientationally averaged water diffusion coefficient <D> will qualify as a new MR parameter able to increase our understanding of pathogenetic mechanisms of reversible and persistent disability. We are grateful to Carlo Pierpaoli, Section of Tissue Biophysics & Biomimetics, NIH, Bethesda, MD, for the useful discussion and insightful suggestions. 1 Address reprint requests to Alessandro Castriota-Scanderbeg, MD, Department of Radiology, I.R.C.C.S., S. Lucia, via Ardeatina 306, 00179 Rome, Italy. Diffusion-weighted imaging findings in Balo concentric sclerosis. Diffusion-Weighted MR Imaging Characteristics of an Acute Strokelike Form of Multiple Sclerosis.